London, 11 October 2017: The latest forecast published by technology research firm CCS Insight shows the global mobile phone market remaining stable for the next five years, with about 2 billion mobile phones sold every year. However, this steady total masks underlying shifts as feature phones continue to decline as a total proportion of the market, 4G technology dominates sales and the first 5G devices emerge. After extensive research, CCS Insight has also updated its estimates of sales of 5G devices, which will begin shipping in 2019. Simeonova comments, “By 2021 we expect 5G-capable smartphones to account for 15 percent of total worldwide shipments. The more uniform adoption of the technology globally means that take-up will be faster than 4G in its first few years. We expect China to quickly become the biggest market for 5G phones as local manufacturers and the Chinese government seek to get a head start on the rest of the world”. 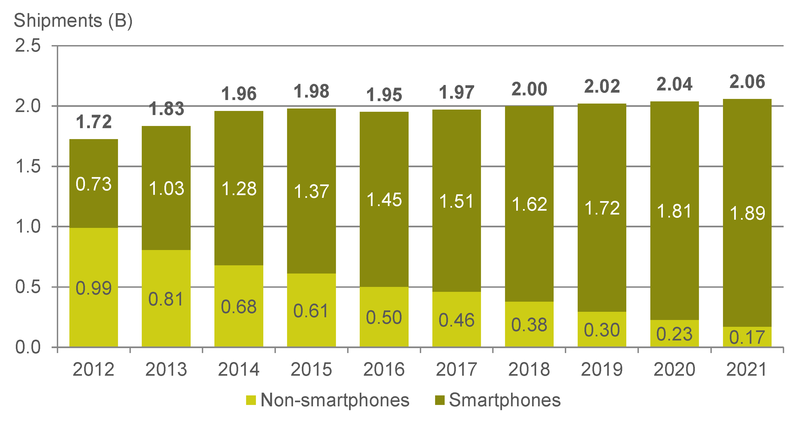 The ongoing decline of feature phones as a proportion of the total market is also clear in the forecast data. Shipments of feature phones will drop from 380 million units in 2018 to 170 million units in 2021. Simeonova notes, “The longevity of feature phones has surprised us but it seems they are now in terminal decline. The widespread availability of low-cost Android smartphones and people’s desire to have near-constant access to the Internet and social networks is accelerating the trend”.